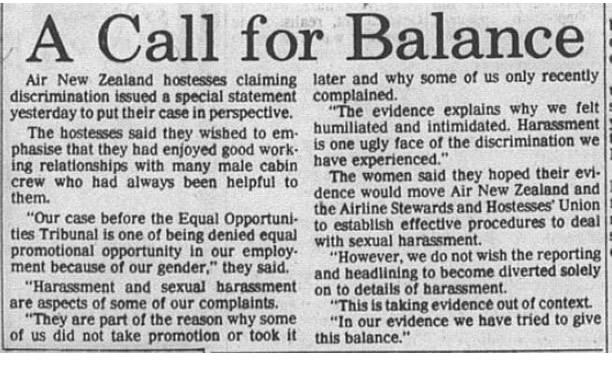 On 18 December 1988, the Equal Opportunities Tribunal ruled that Air New Zealand had breached the Human Rights Commission Act 1977 by not offering female cabin crew the same opportunities for promotion as their male co-workers. The Tribunal declared that the female flight attendants could take claims for damages totalling $1.5 million to the High Court. The decision came after a decade of discussion, agitation and court orders involving Air New Zealand, flight attendants and their union. The case proved to be a landmark event for women’s rights in New Zealand. Over the 1960s and 1970s, attitudes towards women and work had changed, including in the rapidly evolving aviation industry. Air New Zealand’s company policies and staff structures changed somewhat to keep up with these changes, but not fast enough. When female air hostesses were incorporated into the cabin crew structure in 1975, they lost their seniority, affecting their pay, eligibility for promotion and other factors. The inequality became particularly apparent when women who had been employed since before 1975 noticed that junior male staff were being promoted above them. This became more apparent as more women embarked on long-term careers as cabin crew, either choosing not to have children or returning to work after time as full-time carers. When the women approached the Human Rights Commission in 1980, there were no women in the top two ranks of Air New Zealand cabin crew. By 1984, only eight out of 120 assistant pursers (one step up from the bottom) were women; the rest, about 1200 women, were in the bottom rank. Seventeen women took their case to the Equal Opportunities Tribunal after failing to get satisfaction from either the airline or their union. The Tribunal ruled that their seniority must be reinstated immediately; four were promoted to the rank of chief purser. We have 14 biographies, 13 articles, related to Air New Zealand women cabin crew win anti-discrimination case.